Rusty Brockman, Vice President of Economic Development, has been with the Greater New Braunfels Chamber of Commerce for 16 years. 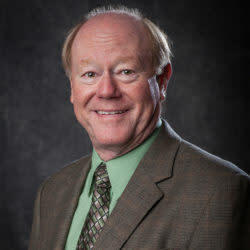 Brockman retired from public education in 2001 after 28 years; 15 of those were with the Comal ISD as campus assistant principal, principal, and central office administrator. He graduated from the University of Houston in 1974 with a BS in H&PE, and in 1979 received his Master’s in Education and Administrators Certification from Stephen F. Austin State University in Nacogdoches, Texas. He spent the first 13 years of his career teaching life sciences, health, and physical education and coaching. Rusty married M’Liss Probst in 1975 and moved to New Braunfels in 1986. They are parents to three children and have 5 grandchildren. Rusty and M’Liss are members of St. Paul Lutheran Church in New Braunfels. Civic organization work includes Board member and Past President of the Wurstfest Association and the 2017 Grosse Opa, New Braunfels Breakfast Lion’s Club President, Drive Chairman and Past President of United Way of Comal County, Advisory Board member of the Comal ISD Public School Foundation, and Past President of the Canyon High School Athletic Booster’s. Brockman was also named Citizen of the Year in 1993 by the New Braunfels Herald-Zeitung, 1992 Chair of the Board Award and 2011 Honors Hall Award recipient of the Greater New Braunfels Chamber of Commerce, and received the Seven Seals Award from the Army National Guard in 2010. In professional organizations, Brockman served as President of the Executive Board of the Texas Economic Development Council, was appointed in 2011 by Governor Perry to the Guadalupe Blanco River Authority and is currently serving as the Board Chairman, Chairman of the Austin/San Antonio Corridor Council Economic Development Committee, member of the Guadalupe Basin Coalition, Board member of the Central Texas Technology Center, Board member for the Alamo Area Academies Institute at Alamo Colleges, and Board Secretary of The Spark Small Business Center in New Braunfels, and Board member of the New Braunfels Food Bank. He is actively involved in continuing the development of higher education, workforce training, and business development opportunities in New Braunfels and Comal County, Texas.